Where Did It All Go Wrong Mr Best? 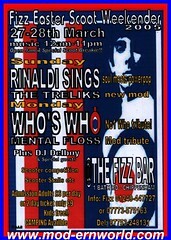 A rare live performance from Rinaldi Sings with a new live line-up. Rinaldi Sings play their first London show in three years to an audience that includes DJ Andy Lewis and 'Bingo' co-producer Paul Bultitude. The second set of the day at the IPO Festival saw Rinaldi Sings play a rousing set in the small but lively Cavern Pub, debuting material from the new album. A third appearance in four years at the IPO Festival in Liverpool for Rinaldi Sings, this time on the bigger, newer front stage of The Cavern Club. Playing two sets in one day, the band previewed songs from the new album, 'Bingo', on public sale for the first time at the festival. An appreciative audience of power pop fans from around the world, locals and tourists saw Steve Rinaldi tackle keyboards onstage for the first time. Bob Kelly of Kelly's Heels guested on guitar and backing vocals. A sold out hometown gig in front of a crowd of 300 saw Steve roadtest material from the forthcoming album, 'Bingo'. The additional of Radio Five Live's Jonathan Overend on keyboards for the one and only time made it a novel appearance. Taking to the famous stage of The Cavern Club at 11.45pm, Rinaldi Sings delivered an enthusiastically received set to a mix of locals and pop fans from all over the world as part of the IPO Festival. After a rousing version of 'A Matter Of Life And Death', the band exited the stage to rapturous applause, with festival organiser David Bash leading the enthusiastic cheers: "Did that lad swing or what,” he announced to the crowd. "Just beautiful, dynamic, awesome". Taking a day off from mixing the new Rinaldi Sings album, Steve Rinaldi made his first live appearance in nearly two years at the IPO Festival in Liverpool. Playing two gigs in one day, just yards apart gave Steve a chance to test out both his new live band and a couple of new songs, including 'I Get High On You', a rewritten version of 'Give Me All Of Your Love', a song performed at Steve's previous live appearance some 20 months earlier. Playing the monthly Songwriter's Night at the Man On The Moon, this was a one-off acoustic appearance by Rinaldi Sings, with a scaled-down two-piece line-up, Tim Panell ably supporting Steve on guitar. The gig was most notable for debuting two new songs - "Give Me All Of Your Love' and 'She Don't Know She's There' – scheduled for the second album. A sizeable crowd packed the main tent of the Mersea Island scooter rally to see the first Rinaldi Sings gig for several months. With various band members unavailable, this was quite an unusual line-up: Tim Charlton returned to his bass role for one night, while Alan Groom, formerly a trumpet player with The Moment, and sax player Chris Daniels made their first appearances with the band. The set was very well-received and 'A Matter Of Life And Death' went down a storm. A benefit gig for the Mod Aid 20 charity staged at Portsmouth's South Parade Pier, one of the locations used for the film 'Tommy'. 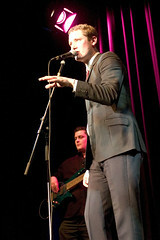 Appearing second on the bill to Mark Joseph, Rinaldi Sings received a rapturous reception from an enthusiastic crowd. The band played a 30 minute set that included new song 'Pick me Up, Put Me Down'. Originally uploaded by Alfie Elkins. Steve Rinaldi chose the Roadrunner club night at the Bullingdon Arms in Oxford to debut his new song 'Pick Me Up, Put Me Down'. As the whole of the 'What's It All About?' album was recorded before Rinaldi Sings made their live debut, this was the first original composition to enter the set in advance of its recording. The band went onstage just after midnight, following a complete running of the film 'Barbarella' as a backdrop to the DJ sets. Headlining for the second time at the world famous Cavern Club, Rinaldi Sings finished a busy night at the IPO festival with a sizzling set in front of about 100 people and were called back on for an encore by festival organiser David Bash. With the addition of Gavin Bowyer on trumpet, this was the first Rinaldi Sings performance to boast a four-piece brass section. The first of two gigs in one day at the Mathew Street Festival in Liverpool, promoted in association with the International Pop Overthrow Festival. With guitarist Chris Borsberry out of the country for several months, the gig was most notable for the fact that the band's resident multi-instrumentalist, Tim Pannell, switched from trumpet to guitar for the gig. His trumpet parts were covered by soprano sax. Wha'cha Gonna Do About It? Playing to a decent sized crowd of more than 150 people, Steve Rinaldi proved a charismatic and winning performer for his homecoming gig, controlling the front of the stage and making sure that every eye in the house was focussed on him. When not playing trumpet, Tim Pannell's second guitar and backing vocals again added a great deal to the band's sound. With cries from the audience of 'Avenues & Alleyways', Rinaldi Sings ended the encore with a reprise of their first single and left the stage with applause ringing round the hall. Continuing with the 'What's It All About?' tour to promote the debut album, Rinaldi Sings returned to Colchester and performed a spirited set to an appreciative crowd. In the run up to the gig, Steve Rinaldi appeared on BBC Radio Suffolk, performing two accoustic songs backed on guitar by Tim Pannell. 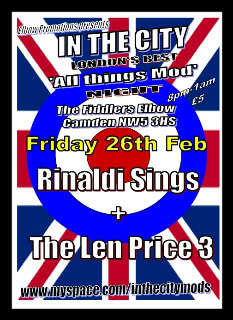 Headlining the opening night of a mod 'weekender', Rinaldi Sings went down well with the small first night crowd. Returning to the venue of their first ever gig, Rinaldi Sings turned in an entertaining set, boosted by a performance of 'Wha'cha Gonna Do About It?'. The gig followed much local publicity, including a Steve Rinaldi interview that covered two-thirds of a page of local paper the Cambridge Evening News. 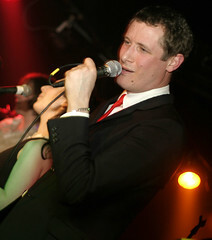 A short set by Rinaldi Sings on Blow Up night at the Metro Club in London's Oxford Street. This well received performance played to a crowd of about 150 was curtailed two songs short of the full set by an over eager soundman wanting to make way for the club night to follow. The crowd for the night included Paolo hewitt and Edward Ball. A fantastic performance from Steve and the band at the Mod Aid 20 pre-launch party. Brimming with confidence in front of a packed house, Rinaldi Sings ran through a 30-minute set as one of the evening's main attractions. The tough crowd were soon won over by the big sound, and by the time the band got to the cover version of 'Everlasting Love', Steve Rinaldi's accomplished showmanship had caught every eye in the house. Rinaldi Sings finished the set on 'Heaven Knows' and exited the stage to allow recent chart star Mark Joseph to run through an accoustic set of songs from his album. After Mark's set, Rinaldi Sings returned to the stage to encore with the Mod Aid charity record 'What'cha Gonna Do About It', and were joined on stage by Mark Joseph, Andy Ellison of John's Children, Chris Philpott of Small World, a host of singers, and some thundering Hammond from 17 Black. 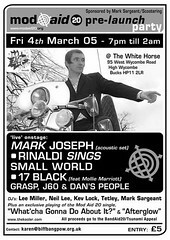 The first Rinaldi Sings gig of 2005 saw Steve and the band return to one of their favourite clubnights, Bitterscene at the Bassment Club in Chelmsford. Richard Hunter returned to the drum stool after guesting as percussionist at the previous gig, and new bass player Simon Lloyd stepped seamlessly into the band. For the first time, Tim Pannell added second guitar and backing vocals to his trumpet/French horn role. A one-off support slot at the 100 Club in London in front of an appreciative crowd sees the grand showman Steve Rinaldi and his band run through their tried and tested set one more time. After two gigs behind the kit, Richard Hunter this time augments on percussion, adding another dimension to the band. As ever, 'A Matter Of Life And Death' proves the stand-out song of the evening - although the magnificent set-closer, 'Heaven Knows', once again pushes it close on the 'clapometer'. A sensational gig review follows in the NME. 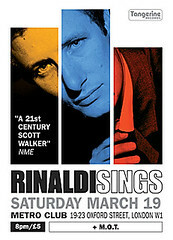 “Welcome to the surrealist splendour of Rinaldi Sings” offers the NME, before describing Steve Rinaldi as “a cocksure 21st Century Scott Walker”. In their first ever support slot, the band performed well in front of 2000 people at the 'Greatest Scooter Experience' festival in Camber Sands. 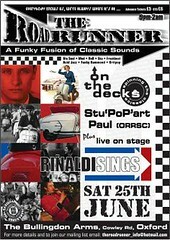 But it proved a mismatched bill, the pure pop showmanship of Rinaldi Sings not appealing to the ska crowd who had assembled to see early ’80s Two Tone chart stars The Selecter. This unnanounced warm-up gig for the band's appearance at the Camber Sands festival was scheduled for Floorshakers, the monthly northern soul club promoted by Steve Rinaldi and his DJ sidekick Graeme Atkins at Needles Cellar Bar in central London. In front of a respectable crowd, the band tested-out the temporary line-up that would be performing at the festival. The band's short UK tour to promote the single ended on a high note in front of a packed Soundhouse crowd. 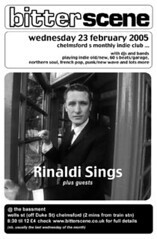 Don Blandford of the Essex Chronicle describes Steve Rinaldi as “a pure pop genius”. After a fabulous reaction from the crowd the previous night in Bath, it was a shame that the band's first gig at the world famous Cavern Club should have been in front of such a mixed audience of foreign tourists and beered-up stag night boys. But the band didn't let the disappointment show as they performed their usual set with confidence. However, an appearance on BBC Radio Liverpool not only results in airplay for the single, but after likening a Rinaldi Sings track to ’60s pop legends Honeybus, the band receive an interested letter from Honeybus singer Colin Hare.